Kristi's block for the month was Keep Calm and Press On. Love her little ironing board and iron she designed for this month's block. She recently put her blocks together and made a very unique quilt out of them. She was totally brave and cut her blocks up and reversed appliqued them...setting the bar high for us! You can check out how brave she was here. It really looks great!!! Love being inspired by what I see others doing but not sure I could be that brave. Love how this little block turned out. I was nervous using such a busy background but it works for me. When I am making a block I forget to take a look at the previous blocks and thinking about my colors choices as how they will look together in the finished quilt. Instead I seem to have tunnel vision with the task at hand and pray they will look good together when the time comes to unite them. Keeping my fingers crossed and pressing on seems to be my motto. Each month Kristi has us link up our blocks in her linky party and a couple people win some goodies each month. My scissors block WON in the month of April. I was the lucky winner of a scrap bag from Fabric Worm. I can not say enough good things about the scrap bag I got. I don't know about your definition of scraps but for me they are not WOF cuts. Each piece I received was a WOF cut. Some 1/3yds, some 1/4yds, and a 1/2 yd or two cuts. Plus they all coordinated together very nicely. 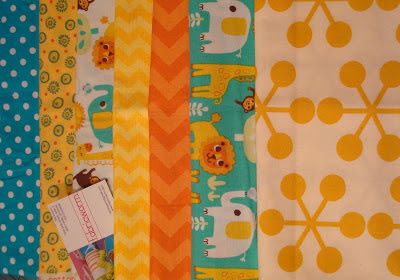 Here is the pretty fabrics that were in my scrap bag I won. So I set off to find a quick little quilt that I could throw together for my daughter's sister-in-law who just adopted a newborn baby boy about the same time I won this. I found this little pattern called 'Baby Birds' for free on the fat quarter shop website. The original pattern had some baby birds---thus the name---appliqued onto the row that I put and elephant and a giraffe and paper pieced the baby's name on. I had the elephant and giraffe appliques just hanging around my house for the last 5 years since I didn't use them in a quilt I made for my first grand-daughter so I was glad to see they fit the theme of the fabrics so perfectly. 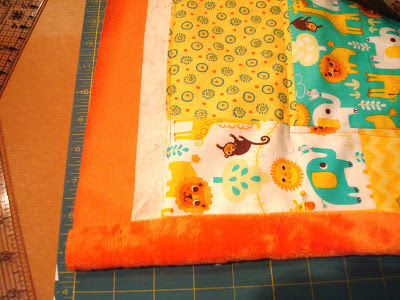 I put minkee on the back and wrapped it around the the front to use it as the binding. When I went to quilt the layers together the quilt wasn't moving to freely on the table top. 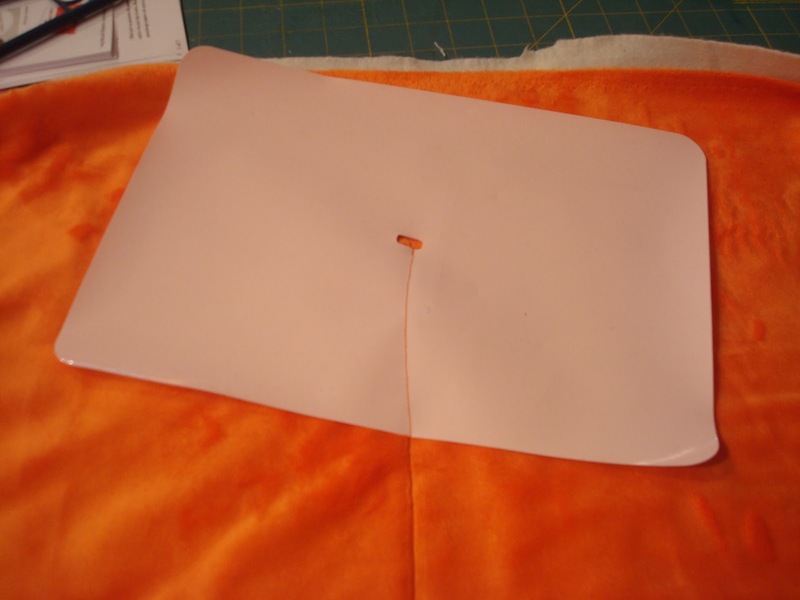 I figured the extra drag was from the minkee fabric itself so I thought I had the ideal fix. I would put my supreme glider on the sewing machine and surely there would be less drag. Next thing I knew when I finished that row this is what I found. My supreme slider must have slide alright and somehow got sewn right into the blanket without me being aware of it. ACCCCCCCCK!!! I hate finishing a quilt top. I dawned a pair of gloves and skipped the supreme slider after that. I think that possibly all the lint from the minkee was just too much for the supreme slider. For sure I think I was suppose to wash the supreme slider between uses and skipped that step. I have a very nice darning foot for my juki that I usually use to FMQ with and for all the straight down lines that I just went top to bottom with I used my regular sewing foot. But once I went around the whole perimeter I noticed that the fabric would push the quilt top into the edge that was now locked in place and I wanted to quilt the chevron so I switched to this foot. It was a cheap (like $6.95 foot) that I bought at Christmas but hadn't used yet. I liked the open toe. My juki quilting foot is a closed circle and it really does block the line of vision of your stitches. I really liked how this foot performed. I always lower my feed dogs with my juki foot it just seems to FMQ better with the feed dogs down. So many times I see Angela Waters or someone else saying you can FMQ with the feed dogs up and with this foot that was very true. I also liked how the edge of the "C" opening could be used to track my path on the quilt to help me get a straight line. This foot hops much better that my other foot and I think that might be the biggest difference. I think I may need to try and do some skillbuilder FMQing with this foot and see if I can get more comfortable with the whole process. 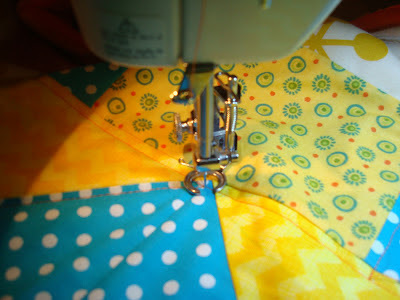 I recently read someones post about using the backing as the binding on the front and then they machine sew the binding onto the quilt. I always do the opposite and put and extra border on the front of my quilt and then use it for the binding which I then wrap around to the back of the quilt and then hand sew the binding in place on the back. I was intrigued with the idea of doing it the opposite because I loved the idea of being able to sew the binding in place and wham being DONE. I must say I was a little unsure of trying it with the minkee but it worked like a charm. Not only that but I LOVE the soft edge that it brought to the front of the quilt. Feels so luxurious and soft. I just cut my backing and batting to measure 2 1/2 inches larger than my quilt top. Once I had them trimmed I peeled the minkee away from the layers and cut the batting back to measure 1 inch. 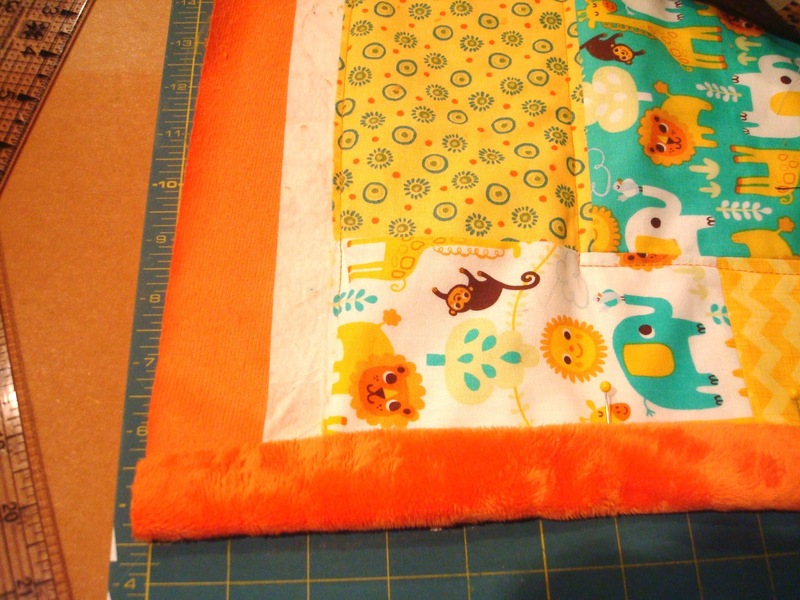 Then I just turned the minkee in about a quarter inch to get rid of the raw edge and then pinned it to the blanket. Mitered the corners pinning throughly and sewed it into place near the edge. I just want to say a huge thanks to Kristy from Quiet Play and to her sponsor Fabric Worm for the fabulous win that made this quilt possible and I know Ryan and his family will be thrilled to be the lucky recipient's of this blankee. I like your block, I'm like you, I just think of individual blocks rather how they'll look together! Great quilt as well, hopefully I might win something eventually! 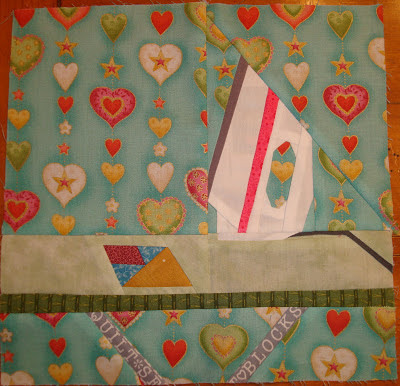 Your block looks so great - I just love the fussy cutting you did on it! Oh and believe me, I was filled with trepidation when I cut into the Wombat Stew blocks to put together hehe! The ones I'm making for And Sew On will likely go together in a much more conventional way!! Love the little quilt you made - so sweet. 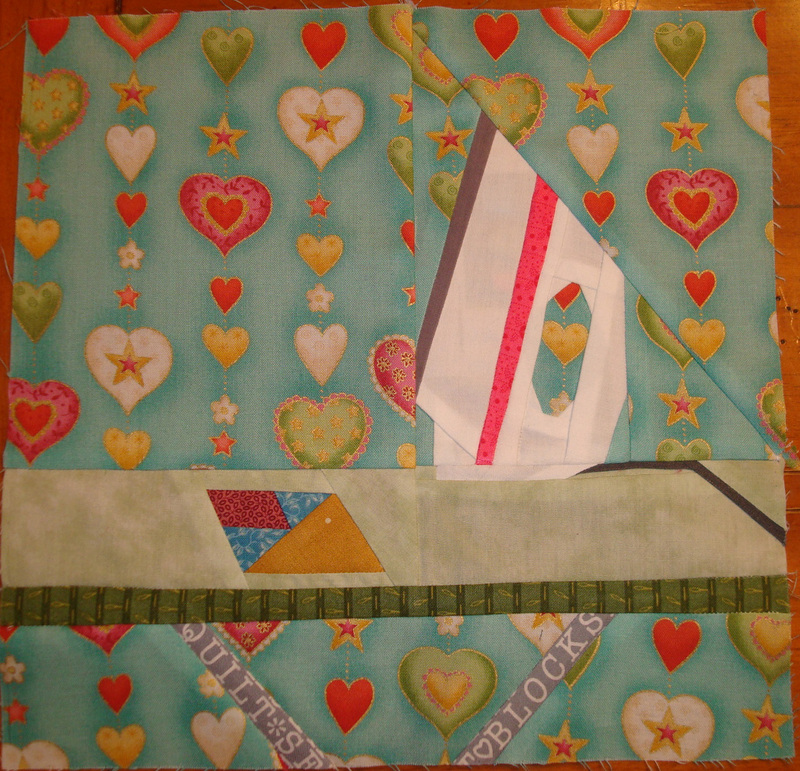 How perfect that the scrap bag was so beautifully coordinated and worked so well for the quilt. Love it! And can I just mention (sorry for the super long comment! ), it had never occurred to me to make a border bigger and stretch it around for the binding on the back! I don't know why I've never thought of that!